1.Stage 1 for coarse sharpening: Place the blade in accordance with the instructions of the picture,lower the knife head slightly,straightly pull it backward with little strength to the arrow direction(don't push forward),pull several times till the knife edge is sharp. 2.Stage 2 for fine sharpening: Place the blade in accordance with the instructions of the picture,sharpen the burr on the blade,gently push forward and pull backward at the fine slot. 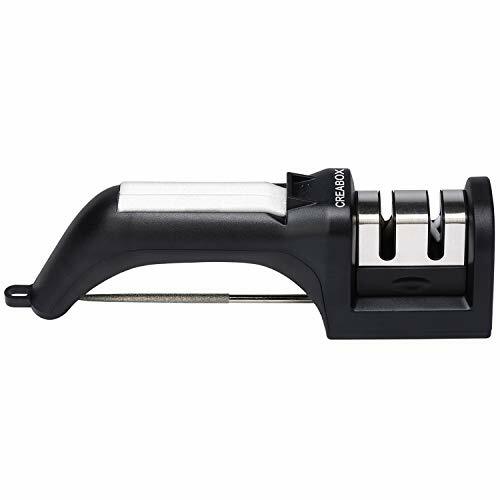 3.Scissors sharpener: Place the blade in accordance with the instructions of the picture,open the scissors at 90°,the scissors plane is close to left side,and the edge is downward vertically,push forward and pull backward with light strength till the scissors is sharp. 4.Detachable design: Press the groove to remove the part. 1.It doesn't work for ceramic knives. 2. Don't put sharpener in or on water.Keep the sharpener dry and clean. 3.Please thoroughly clean off the grease dirt on the cutting tools before grinding the mill to avoid the negative influence to the operation performance of the grinding machine. 4.Sharpening stone will scratch the blade when used improperly,please be careful! 1 x product use note card.